In June we were watching the FIFA World Cup. Bradley was waking up early every morning to watch it before going to work. Then that was overlapped with the beginning of the Tour de France and he started watching that every morning. Now that it's over I kind of miss it. How likeable is Andy Schleck?? So I had heard about the Tour de Fleece but never participated. If you Google it you'll find lots of blogs with spinning posts. It's just like the Knitting Olympics but for spinning. You set yourself a spinning goal and spin while the Tour de France is on. This year I unofficially joined up with the goal to finish up a few spinning projects. I had little bundles of spindles with partly spun roving stashed all over the house. So now I can show you some more of my finished yarn! 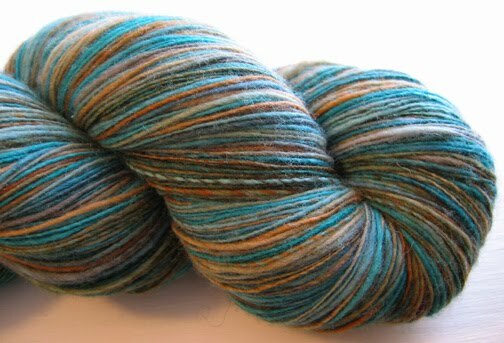 I've decided that with all the work I was doing spinning fine (and trying to be even) singles, I would try keeping more of my yarn as singles. I like having thinner yarn and more yardage. 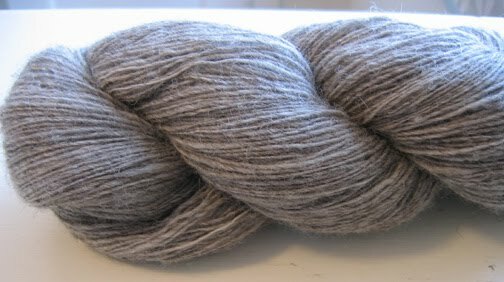 A single isn't as strong as plied yarn but depending on what you're making it can be fine. And they're so pretty! I can't remember if I've explained how I set the twist, but all I do is wind the yarn onto a pair of purse handles and soak it for a while in warm water. I add a little bit of hand soap (Body Shop Satsuma) just so it smells nice. This also washes the yarn a bit extra in case the fleece wasn't perfectly clean beforehand. Then I rinse the wool, gently squeeze (not wring) out the excess water, whack the skein against the side of the sink - just a couple of times - then hang the yarn to dry. I put a light washcloth inside the loop of yarn so that it doesn't tangle and I find it helps absorb some of the water so that it dries faster. If the weather is nice I hang the skein in our backyard - a skein dried in the open air has a lovely fresh smell. 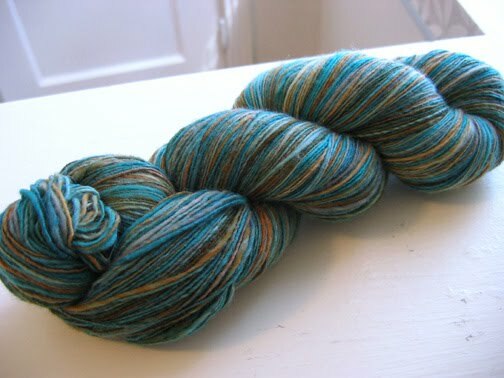 The second skein I finished was the Rusty Ship merino that I dyed myself. I had spun half of it already and it was sitting on a bobbin. I love how this one turned out. Keeping the singles makes the colours more distinct, with just a little subtle candy-caning (ie. two colours twisted together for a candy cane stripe effect). 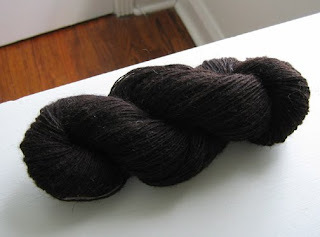 Then lastly, I finished a nice rich brown Shetland from Lettuce Knit. I love Shetland, it's lovely to spin and the finished yarn is soft and cushiony. It feels good to get some WIPs all finished. 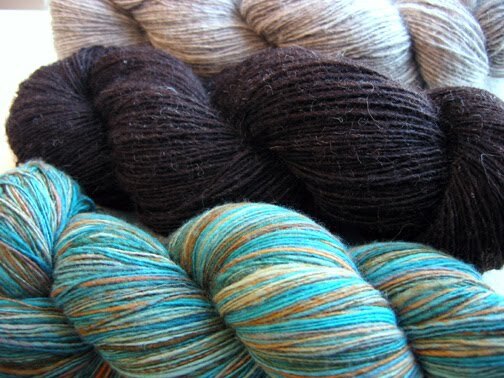 Also I like having some nice skeins ready for the fall when I'll start to feel like making some new winter knits. 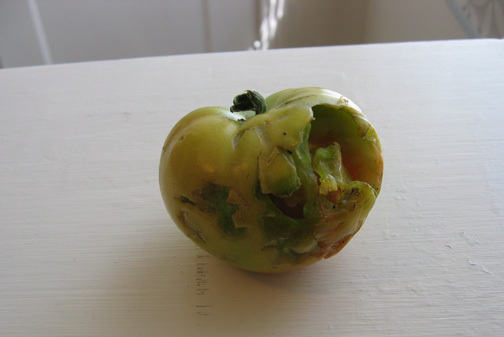 But today was not all good, someone took a big bite out of our first homegrown tomato! Bradley planted peas, carrots and beets this year, and I planted some already started tomato plants from our local market and a herb garden. Everything seems really slow to grow, and we finally had one of the tomatos turn a little bit orange.. and just as I was thinking I should probably bring it in, there it was this morning with a big bite! Boo. Beautiful yarns. I hope to learn to spin someday. I love that you explain the process of your projects. We are just now getting our tomatoes. Sometimes I bang on the window when I see the squirrels messing with my vegetables. When I open the front door there is most often scurrying. Ha ha, the Tour de Fleece - I love it! My hubbie is big into biking so we watched the tour on TV. I don't spin but maybe next year I'll knit during the Tour.